In the 1860’s nearly half the vineyards in France had fallen to a terrible blight. Vines, many of them decades old, were faltering, not producing grapes, then eventually dying. No one knew why. The blight lasted for over 15 years, closed over 4 million wineries, and devastated the French economy. The government offered a reward of 320,000 francs to anyone who could cure the problem. A team of French biologists figured out the cause in 1870: an aphid, introduced from America, called phylloxera. This tiny insect would nest in the leaves (like the one I photographed above), hatch, fall to the ground, and consume the roots of the grape vine, eventually killing the plant. Knowing the cause was a help, but there was no cure. Farmers tried pesticides and other chemicals. They left frogs under the plants, and let chickens roam the vines with the hope that they would eat the phylloxera. None of these ideas worked. It was Leo Laliman and Gaston Bazille, a team of previously unknown wine growers and viticulturists, who suggested the solution of grafting America’s phylloxera-resistant rootstock on to French vines. Their solution worked, and over the following years there was a great reconstruction of the wineries and their vines, and eventually the wine industry returned to normal. That bark covered stick is a chunk of harvested American rootstock. 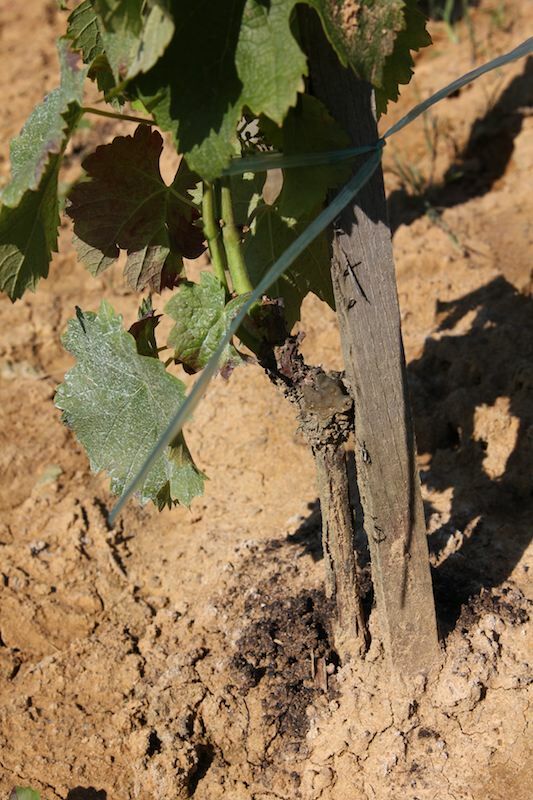 An inch-long portion of a French vine was grafted on top, and has since grown into several new, green vines. 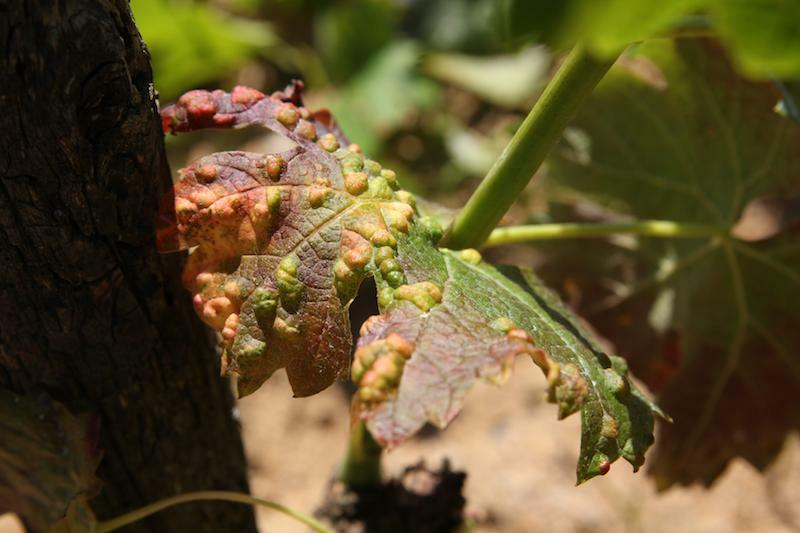 Though the plant will likely contract phylloxera (many vines have diseased leaves like those in the top photo), the plant will remain strong and hopefully produce grapes for decades to come. That American rootstock will also attempt to grow vines, and their removal is one of the common chores on all wineries. In fact, that’s what I spent most of this morning doing with a spade and pruning shears. As for Leo and Gaston, they did not receive the 320,000 reward. The French government argued they had not cured the blight, but only stopped it from occurring. F’n French cheaters. No wonder Germany invaded. Love the education. Not getting my email alerts of new blogs. Thought you guys had gone native and were not longer blogging. Glad to discover you were still going strong. It’s good to see government officials are not to be trusted in any country. And I ~saw~ the Esperanto movie with Shatner and it was hysterical. In an interview he said the director insisted that only Esperanto be spoken on the set. Shatner credited the dreamy, dazed look on many of the actors’ faces to utter confusion as to what was going on, whether or not the scene was over, what they were supposed to do or what anyone was saying because no one actually understood Esperanto, they all just learned their lines in it. Glad you’re having fun. I was just thinking of you two the other day. Hoorah!